Despite the urban legend about the Mayan Calendar, it's unlikely the world will end on Dec. 21, 2012, says Austin-based astrologer Donna Woodwell. 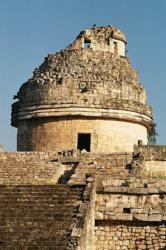 Mayan starwatchers followed the movements of the Sun, Moon and Venus from observatories such as this one, located in the ancient Mayan city of Chichén Itzá. A few clients have called me with concerns about the end of the Mayan calendar on Dec. 21, 2012. I reassure them 2013 is still coming soon. It's safe to buy a 2013 calendar; we'll still need it. "A few clients have called me with concerns about the end of the Mayan calendar on Dec. 21, 2012," says Donna Woodwell, a professional astrologer in Austin, Texas, who serves on the board of the International Society for Astrological Research. "I reassure them 2013 is still coming soon." "What's happening in December is the start of a new Mayan long-count cycle, something like beginning a new millennium in our modern calendar," says Woodwell, who also holds master's degrees in Latin American Studies and in Journalism from the University of Texas at Austin. "The world didn't end when our calendar switched to the year 2000, and it's unlikely it will when the Mayan calendar reads 13.0.0.0.0," said Woodwell. "In fact, the last time the Mayan calendar ended it was 3114 BCE, and we're still here. This is nothing new." This apocalyptic urban legend began in the late 1980s with José Argüelles, an art historian turned metaphysical author, who popularized the notion of 2012 as the beginning a new age of enlightenment. His philosophy drew heavily from Mayan cosmology and concepts of time. What makes the Mayan calendar different from the modern calendar is its more profound emphasis on the cyclic nature of time, according to Argüelles. "For the Maya, there was less emphasis on linear progression, and more on how experiences and cycles repeat themselves. In short, they may have agreed with Voltaire: The more things change, the more they say the same." Other new age authors took inspiration from Argüelles and made their own forecasts. For example, Terence McKenna foresaw the end of time in his fractal theory of time, which he called Time Wave Zero. His model suggests Dec. 21 as the start of a new order of complexity in the world. He based His calculations on the mathematics of the I Ching, an ancient Chinese text known as the Book of Changes. In her astrology practice, Woodwell works with clients seeking a holistic approach to achieve their maximum potential. "My clients are successful people who want to make their own lives – and the world -- a happier, healthier place," says Woodwell. "We shouldn't let doomsday theories detract from the fact that our world does indeed face serious environmental, economic and geo-political challenges in the new millennium. Whatever may occur, it is still our responsibility to clean up the messes we have made."